ANDOVER - While you’re out crossing off names on your Christmas list this year (and are a student at PV especially) consider offering something special to the less fortunate by donating a gift for PV FFA’s Toys for Tykes drive once again this year.(Nov. 30 edition). According to Madison Gabriel, this year’s FFA toy drive is scheduled to take place Friday, Nov. 30 through Wednesday, Dec. 10 at PV High School. Bins will be setup in the agriculture room, high school office and within individual classes with a goal to fill a big blue tub that FFA uses. For further information about donating to PV FFA’s Toys for Tykes drive please contact Thomas Mazzaro at the high school. 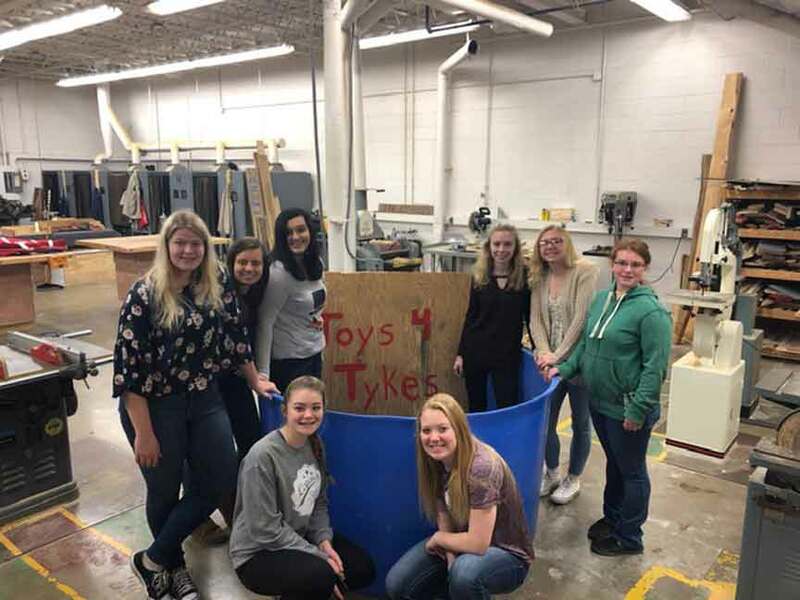 Pictured: PV FFA members Kari Clute and Allison Graves standing in front of their Toys for Tykes holiday collection bin while Emily Millard, Taylor Kiser, Amber Fazal, Aubrey Hane, Mogan Sharpe and Katelyn Crouch stand behind it. This year’s drive is set to take place from Friday, Nov. 30 through Wednesday, Dec. 19 this year.